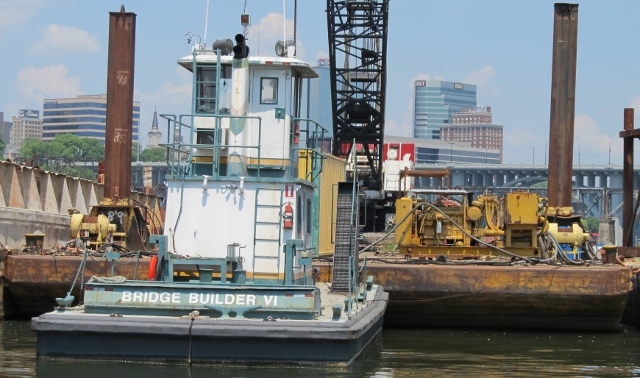 Our barge is a 1/5 scale deck barge but it is shortened to 60% of the normal barge length. We need to be able to get the boat and barge on a trailer for over the road moves. Our barge will have spuds for stabilization at stops as needed. Final design of our deck barge. She is now 25′ 6.25″ and has scaled 40 footers aft and 20 footers mid. We are featuring our Ship By Barge theme on the sineage. 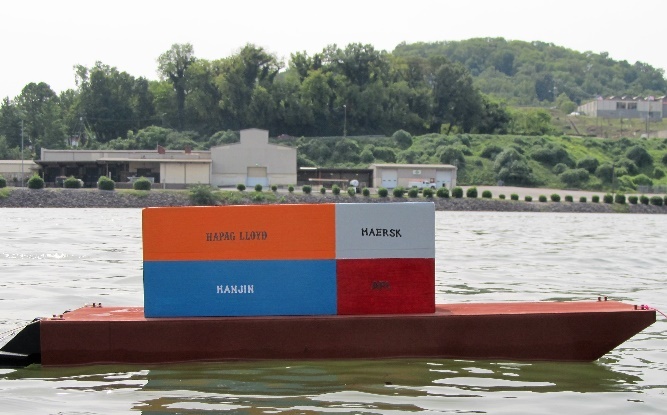 Scale Model container barge in Knoxville is 1/35 scale and is being used for hydrodynamic tank testing. 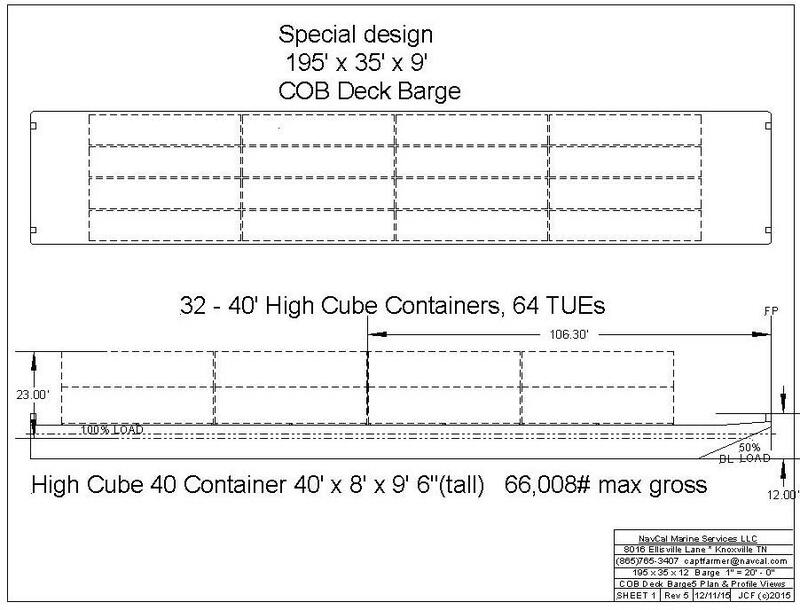 Full size container barge, suggested design by NavCal Marine Services, LLC, allows more 20 foot or 40 foot high-cube containers to be shipped on a special purpose deck barge that retains the standard 35′ x 195′ form factor. Sectional barges are the smallest. They are made up of sections that can be joined together to vary the configuration. 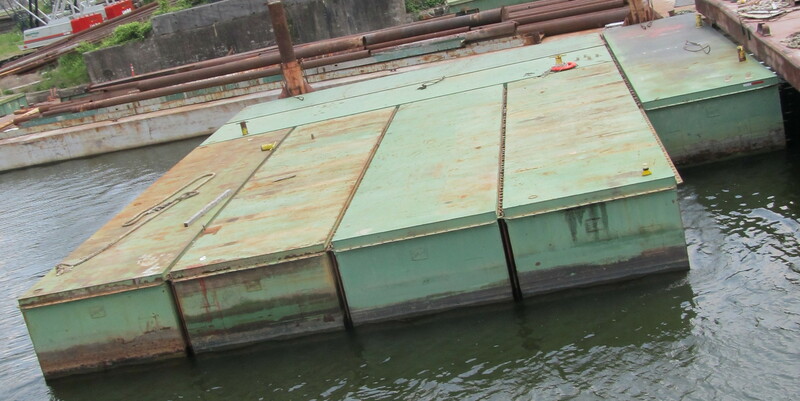 These barges are held together with vertical rods through the flanges at the top and bottom of each barge. Deck barges are next smallest. They can vary from about 50 to 195 feet and are often used as construction platforms. A special case of the deck barge is the spud barge shown below. Spud barges are a variant of deck barges. They have added “spuds” (vertical posts) to anchor the barge during constriction work. This barge has square spuds and some use round spuds. These are sometimes called “crane barges” as they often a have crane aboard for lifting materials. Jumbo hopper barges are very common. They are standardized at 195′ x 35′ x 12.5′ and can typically carry about 1,500 tons of material when loaded to a nine foot draft. Coal and aggregate barges are often open but salt and grain barges have fiberglass covers. These barges can have a rake (sloped) end or be boxed on both ends. A “Unit tow often has “rakes” out front and “boxes” for the others. Here is a “rake” one sloped end with covers in place. 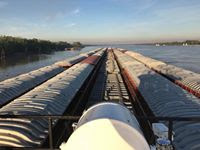 Super Jumbo Barges are 14 feet deep and can be loaded to a draft of 12 feet on the lower Mississippi. Petroleum and asphalt barges are normally longer that 195 foot jumbo hopper barges. They both have deck mounted transfer pumps and asphalt barges also have deck heaters. “Forty barges on the Buckeye State, eight long and five wide, makes us 1,841 feet long (with barges/boat/bow unit) and 175 feet wide…not too shabby.”, Capt. John.